Minuteman Landscaping, Inc. The natural choice in lawn care since 1984! People aren’t sure what it is. You might have seen them – tiny green inchworms crawling on the bark of oak trees, maples and fruit trees. You might have noticed more caterpillars around or more moths fluttering around your outdoor lights. You may not know what it is, but you know something is wrong, especially when the leaves on your crabapple start to look like Swiss cheese! 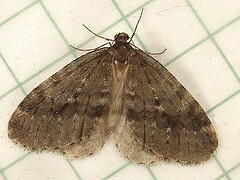 Winter Moth (Operophtera brumata). This insect whose larvae attack and feed voraciously on a large number of deciduous trees, fruit trees and flowering shrubs, has been appearing in greater numbers throughout the metro west areas as well as the greater Boston area. What can we look forward to this year, how can we spot the insect and most importantly, what can we do to combat the problem? Understanding the Winter Moth life cycle is extremely important in helping to detect for the adults and also when to treat for the larvae. Adult male and female beetles will emerge in the late fall (November into December) to mate and subsequently female beetles will lay their eggs. These eggs hatch in the spring. This year temperatures have remained cooler due to the excessive snow pack and we can expect to see larvae hatch and begin their journey to feed on the inner buds of a newly developing leaf sometime in late March and into the second and third week in April. 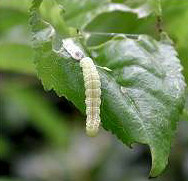 These larvae are extremely hard to spot especially when young as they tend to hide in the barks of trees or make their way into newly developed buds where the majority of the damage will occur. Only when the leaf becomes visible are you able to see the damage that has been inflicted by this menacing little pest. Entire trees can be defoliated or you can expect to see small chew holes in the newly developed leaves. Photosynthesis is disrupted, diseases are more common and if nothing is done to stop the life cycle of this pest, the health of your trees or shrubs will be negatively altered for some time. What can we do to slow this insect or better yet eliminate it from our landscapes? The most effective way to combat the Winter Moth larvae is to spray for it in the early spring before the larvae have time to reach the foliage and begin feeding. We normally split the treatments into two applications to ensure complete success. These treatments are generally done closely together and need to be scheduled in the early spring. Please call us to sign up for Winter Moth spraying. We will continue to monitor this problem and stay on top of the most up to date research. Thanks again and remember – do not wait until the damage has been done. Be proactive and call to schedule an appointment with one of our friendly professionals and/or request an estimate if this service is not already a part of your lawn care program. GO GREEN in 2013! © 2019 Minuteman Landscaping, Inc.. All Rights Reserved.